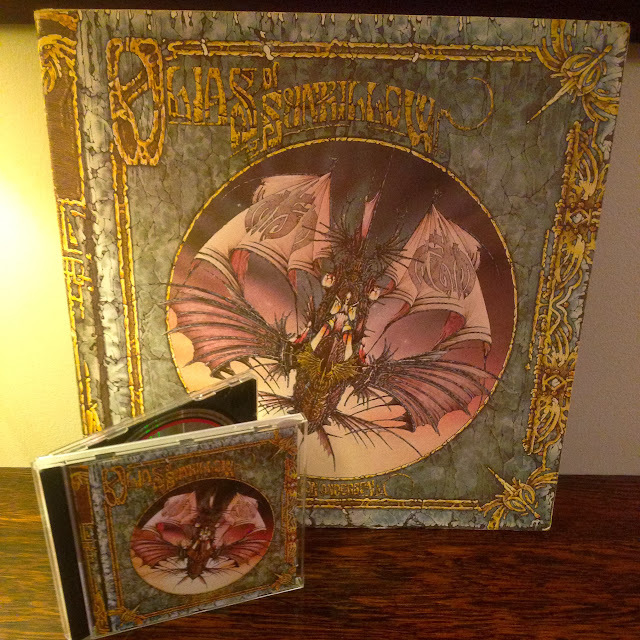 Headphonaught's Nanolog: 40 Days of Enough ... Day 10 - "Olias of Sunhillow"
40 Days of Enough ... Day 10 - "Olias of Sunhillow"
I have "Olias of Sunhillow" by Jon Anderson on both LP and CD. The CD came first ... bought with Christmas money between Christmas and Hogmanay, 2013; The LP came later ... picked up for less than the CD in Vinyl Villains in Edinburgh recently. I know this goes against what I was saying yesterday ... and it does seem rather crazy to own both versions ... but. in my defence, I love this album so much. It is a wonderful progressive expression with some seriously great synths ... it sounds great on my hi-fi or in the car. What's more ... I love the packaging of the LP. The artwork on the CD is a poor reflection of the LP ... it is really bad, in fact. Holding the LP cover and examining it is a real pleasure ... one that we lose with plastic CD covers (not so much card sleeves). '40 Days of Enough' is about appreciating what you have. Collecting vinyl, in a perverse way, is too ... it is about the albums that are so special that you want (but not need) them on vinyl. My intention with record hunting is to find albums that I don't have ... but every-so-often an album will be so good I'll grab a second copy. I guess that's the power of great music.